A group of illegal Israeli colonialist settlers invaded, on Monday morning, privately-owned Palestinian lands in Beit Iskariya village, south of the West Bank city of Bethlehem, and started planting them with trees. The head of Beit Iskariya Village Council, Mohammad Ibrahim, said the colonists invaded and occupied the Palestinian lands in the al-‘Awareed area, near the illegal Netivot colony, which was built on the villagers’ lands. He added that the villagers chased the colonists out of their lands, before they ran away to their illegal colony. 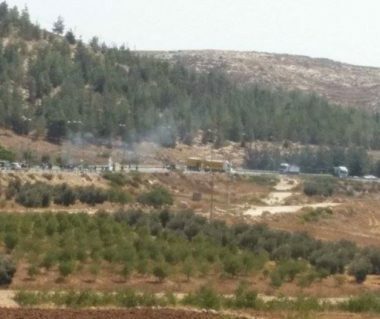 Ibrahim stated that the lands are owned by members of Odah local family and added that the settlers invaded nearly 10 Dunams out of 40 Dunams they have been trying to illegally occupy. He also said that the Palestinians have the official deeds for their lands and hired a lawyer to maintain the case.